The dining room is cozy but spacious allowing guests to settle in and be comfortable while enjoying a private meal. 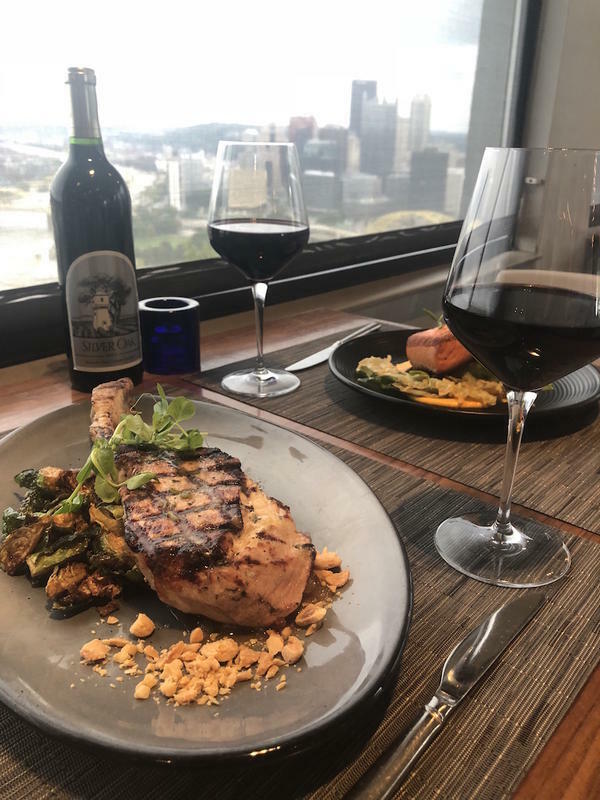 The incredible view can be enjoyed from any seat in the dining room but the row of tables in the front window offer a jaw dropping view of downtown and the surrounding area that will leave you talking about it for a long time. Of course, it would be impossible for the incredible view not to compete with the food for the center of attention. This has brought out the best in Chef Jessica Bauer and her dishes easily overcome the competition. 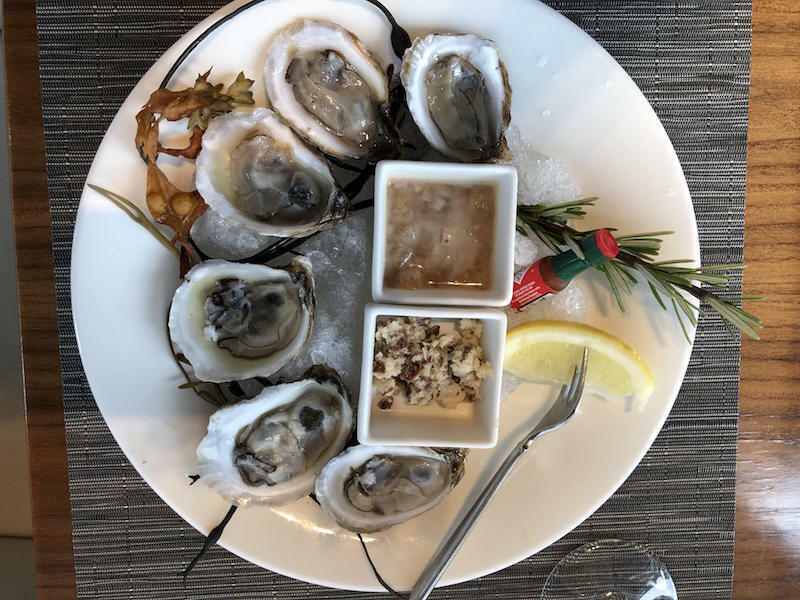 We recently dined at Altius and were left in awe by the food we ate, the view and the lasting impression made by the staff. 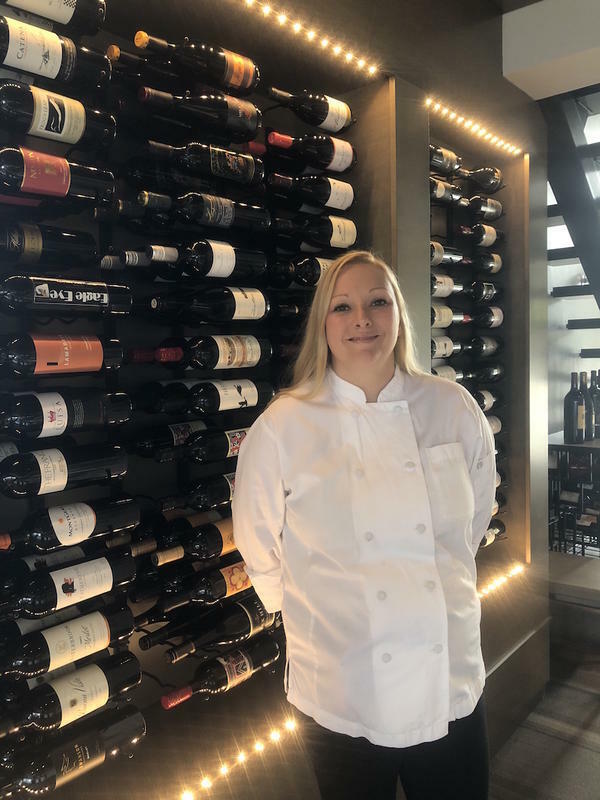 Chef Jess’ dishes are passionate and it is apparent that every component of every dish has been carefully chosen and prepared to come together in a perfect plate of fine cuisine. She has succeeded in making the meal at Altius the star! Our appetizer of Grass Fed Steak Tartare was a unique and great start to the meal. The consistency was firm and the pickled mustard seeds an excellent compliment to the beef. The arugula pesto, caper and cornichon relish, black garlic aioli, toasted baguette, pickled mustard seed, egg yolk and crispy shallot added additional flavors bringing the dish to completion. The Chilled Oysters were as fresh as imaginable and the red beet horseradish and cucumber mignonette was very sassy! For entrees, we tried the Duroc Pork Chop and the Ora King Salmon. The pork chop was presented as a “life changer” according to Chef Jess and she was telling the truth. This was the most tender and juiciest pork chop I can remember and nothing short of divine. The additions of crab apple and gooseberry mostarda, crispy Brussels sprouts and smoked Gouda purple potato puree took the chop to new heights. Prior to the Pork chop being served I noted the absence of any sharp knives and assumed I would get one when served but not so. And I didn’t need it. They already knew! The Ora King Salmon was cooked to a perfect and tender medium. The salmon was complimented by ponzu miso butter, beluga lentils, smoked carrot and ginger puree, wasabi mousse and then the crispy bok choy which was a nice twist and completed a perfect plate. The entrees were high notes and we expected that was as good as it gets but we found out differently when we decided on the Hazelnut Docquoise for dessert. 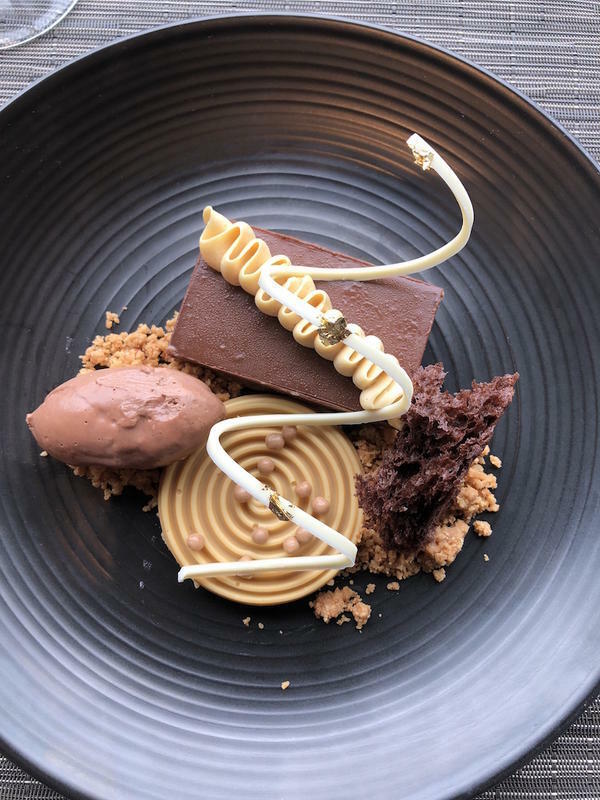 This unique combination of praline dark chocolate cremeux, hazelnut crumbles, chocolate spongecake, caramelized chocolate cremeux and burnt honey diplomat cream was just too good to be true. It was truly a special ending to a very memorable meal. All the great word of mouth we had heard about dining at Altius was in fact true! I’m glad we had an opportunity to experience it ourselves and share with you here. Their tagline “Elevated Cuisine” comes to life in every aspect. The location, staff and menu are a winning combination in every way. Chef Jess’ hands on and careful approach to creating a memorable and pleasant dining experience are evident throughout the menu.